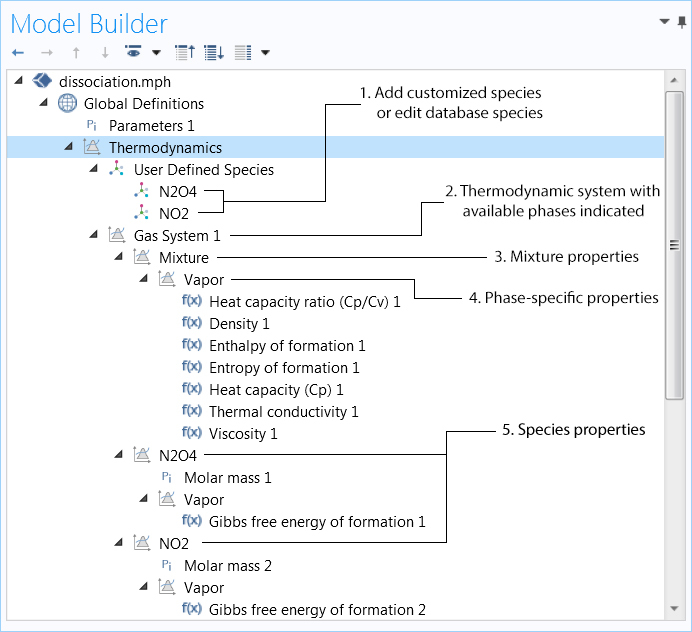 For users of the Chemical Reaction Engineering Module, COMSOL Multiphysics® version 5.4 includes an updated interface for the Thermodynamics features, new functionality for reactions in chemical species transport, and automatic definition of equilibrium constants. Read more about these chemical reaction engineering features below. Several updates to the Thermodynamics interface make it more user friendly, as shown in the following bullets and accompanying image. The new Partition Condition feature can be used to prescribe the ratio between the concentration of a solute species in two adjacent phases. 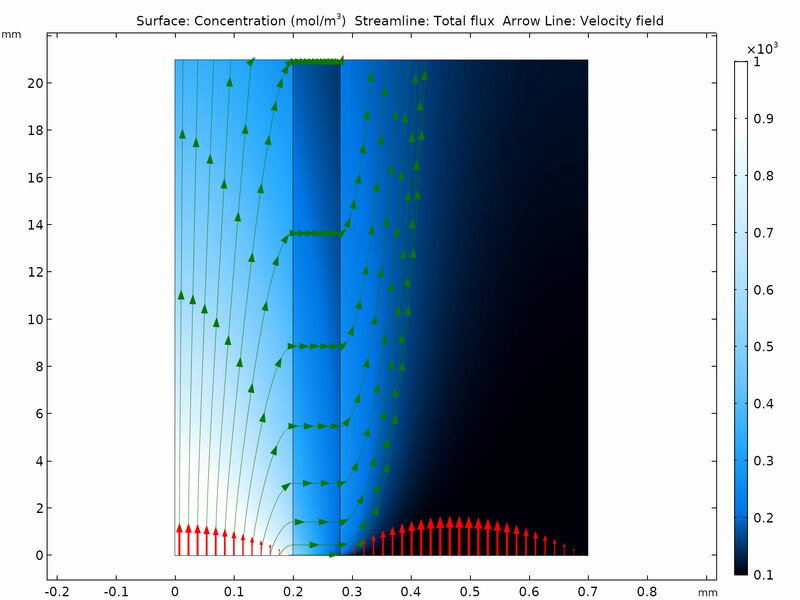 For example, you can use it to model conditions at the interface between two liquid phases, a gas-liquid interface, or the interface between a liquid phase and a porous medium. You can see this functionality demonstrated in the Separation Through Dialysis model. Contaminant transport streamlines in a hollow fiber dialysis device. Partition conditions are used on both sides of the porous membrane in the middle. Contaminant transport streamlines in a hollow fiber dialysis device. Partition conditions are used on both sides of the porous membrane in the middle. You can now model infinitely fast irreversible heterogeneous reactions. In this case, the reaction rate is limited by the species transport to the reacting surface. The new Fast Irreversible Surface Reaction feature prescribes the concentration of a rate-limiting species to zero, and balances the fluxes of all participating species according to the stoichiometry. A new feature for modeling equilibrium reactions in domains and on boundaries is now available for concentrated mixtures. The feature is called Equilibrium Reaction for domains and Surface Equilibrium Reaction for boundaries. In reaction engineering, the equilibrium constant, which is used in an equilibrium reaction or a reversible reaction, can now be automatically defined in terms of the Gibbs free energy of the reaction. When coupled to a thermodynamic system, the equilibrium constant can automatically be defined using thermodynamics properties. 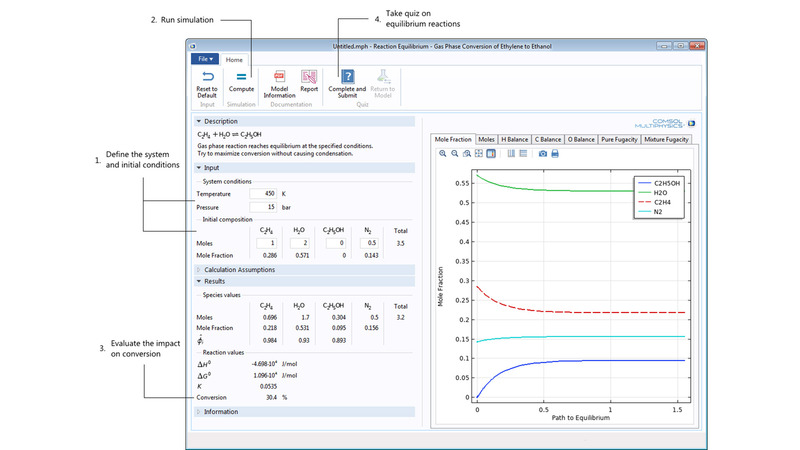 The Reaction Equilibrium application is designed to be used as a teaching tool, both to provide an understanding for the dynamics of a chemical equilibrium and to show how to compute quantitative results for the equilibrium composition.